Amazon, eBay, Walmart, and other marketplaces are all competitive marketplaces with millions of users. Sellers are constantly searching for new products to sell, but finding worthwhile products is a real challenge. You have to consider things such as a product’s demand and competition levels, profit margins, shipping and other fulfillment expenses, and so much more. With so many factors to consider, combined with the regular duties of running your online business, it can be exhausting. After all, there’s only so much time in a day to get things done. Successful sellers know how to use their time efficiently, that’s why they see the value of using product sourcing tools. Product sourcing platforms offer your business a lot of advantages, many of which are essential in the competitive eCommerce landscape that exists today. This one shouldn’t come as a surprise to you. With millions of products for sale, you can’t afford to take a chance on a product. Sometimes the trendiest products aren’t worth considering during your product sourcing efforts. Need proof? Look at all the fidget spinners that people invested in a few years ago and were stuck with when the fad ended. A product could have many sales, but if the fad ends, the market is saturated, or the other sellers are too established, you may have difficulty competing. On top of that, they may be able to sell their products at a cheaper price than you can even source them. When it comes to sourcing products to sell, a product research tool provides you with actionable insights that help you make the right decisions before you dive in too deep. It saves you valuable time, and time is your most important asset. Every product you sell needs to make you a profit. If you are selling something for a loss, you aren’t doing it right. Sure, you may try and clear dead inventory at a discount to recover capital, but this is often a desperation move and not a winning strategy over the long-term. 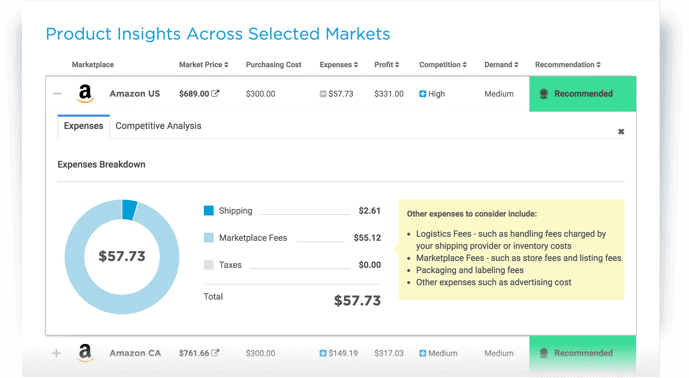 An eBay and Amazon sourcing platform, like Algopix, is valuable because it shows you your estimated profit and expenses before you ever place an order with your supplier. In the above example, the product costs $300 to purchase, has $57.73 in expenses, sells for $689, and generates $331 in profit. You can see that the average shipping price will cost $2.61, while Amazon will take $55.12 in marketplace fees. Beyond that, the product has high competition and medium demand. With net profit margin of 48%, that product is a profitable opportunity and leaves enough room to cover returns and other potential issues. The more a seller knows before sourcing products for Amazon and eBay, the better. This kind of information is exactly what you need to make profitable decisions, and it helps you avoid stocking items that will lose you money. Competition isn’t always a bad thing because not all competition is created equally. On Amazon, a product may have many sellers, but if they are all newer, unestablished sellers, you can dethrone them more easily and become the top seller for a product. 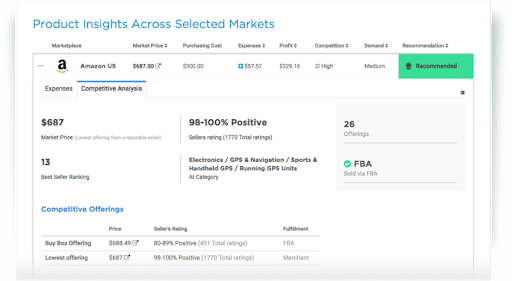 A product sourcing tool lets you analyze your competition to see which of your competitors you can outcompete. You can check their overall seller rating, the number of reviews they have, and other important metrics during the product sourcing stage. So, when you find a product you like, you can quickly determine if the competition is serious or not. We see it all the time, where an Amazon seller is unwilling to try eBay, and vice versa. This is the wrong approach. Luckily, with eBay, Amazon, and Walmart, there are still a few large marketplace options. You can diversify and find new sales opportunities within your same country. You can also diversify internationally. While cross-border selling has its challenges, sometimes your product may have a significantly higher selling price on those marketplaces. The best sellers understand the importance of selling their products on any marketplace that they can compete in, and make a profit. Even though your preferred market may be Amazon US, you shouldn’t rule out the other Amazon marketplaces if there is demand for your products on them. That’s where a product sourcing tool comes in. A comprehensive product sourcing platform can show you all the relevant data for different marketplaces. Algopix supports 16 international marketplaces in eight countries for Amazon, eBay, and Walmart. Finding profitable products takes a lot of time. A product sourcing tool is designed to save you time by streamlining all of the important data you need to gather. What used to take you hours or days can be completed in minutes by verifying the KPIs that matter most to your business. 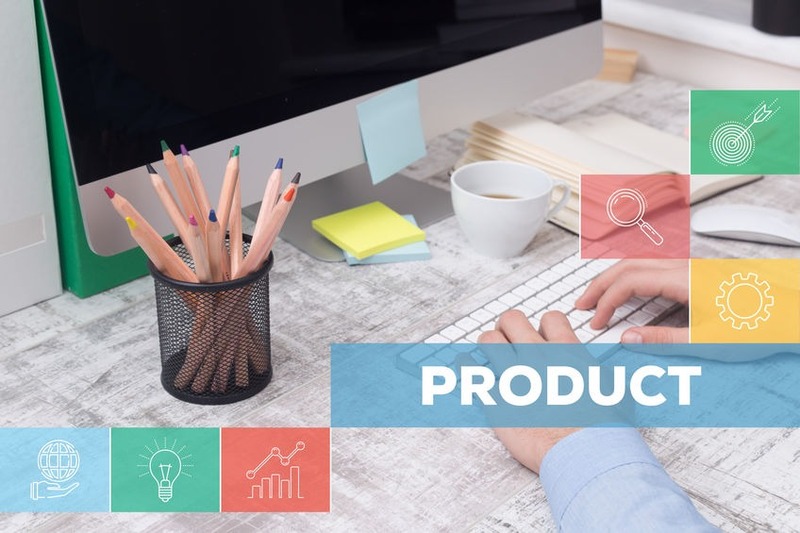 By saving time on your product sourcing, you can spend it working on other areas of your business like optimizing your Amazon listings, taking high-quality product photos, and improving your marketing efforts.